Performing a job search online can be a long and strenuous task. The amount of sites offering job opportunities and job placement is almost endless and keeping track of where you’ve applied can be difficult at times. Some applicants attempt to keep track of their job applications via pen and paper, but this can take up a lot of valuable time. Other ways of recording applications is through overly-complicated web browser bookmarking systems. Implementing the use of a job specific, detailed spreadsheet can help employment seekers monitor where they’ve been and what exact jobs they’ve applied for. The perfect addition to any job search is the free Job Search Log template. With the search log, you can keep detailed record of every company you’ve applied to. A comprehensive set of fields regarding every aspect of every job you have looked at is included in the template. Read on to learn how to use the job search template. 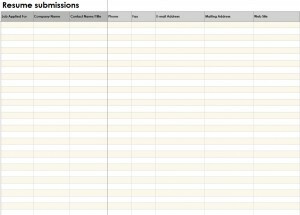 There are three main fields which should be filled in after every application submission. These include job applied for, company name, and contact name and title. Don’t forget to record the phone number, email, and web site address for each job that you have applied to. Make sure to input the date you submitted the resume along with information regarding the job description. Save the spreadsheet after every application has been recorded so you don’t accidentally lose track of where you have applied. Use the search log to keep track of companies’ responses to your resumes. These can help you tremendously in the future by showing you where to look for work in the future. Many people are having a hard time finding work. Making use of any tool to aid you in your search is the smartest thing to do. The Job Search Log template can go a long way in helping you find the job of your dreams.